The use of rolled steel H-beams to function as bearing piles is a comparatively recent development in piling industry. H-piles can withstand large impact stresses developed during hard driving. This type of pile has proved to be especially useful when the pile is expected to penetrate a rock or through hard substratum. On account of the smaller cross-sectional area of the pile, it can be driven to the desired depth without jetting, coring or adopting other methods of soil displacement. They require less storage space and can be handled without much difficulty. 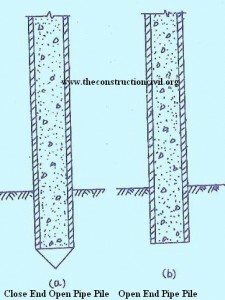 H- piles can be advantageously driven close to an existing structure as they produce very small soil displacement. H-piles can be securely spliced. Spliced H-piles have been driven to a maximum depth of 100 m. In situations where the piles are liable to corrode, they are coated with coal tar or some other type of suitable coating or they are encased in concrete. The smaller cross-sectional area of H-pile makes them function less effectively as friction or compaction piles. After the piles have been driven to the required depth, the pile heads are cut square and a steel plate cap is welded to each pile and finally the pile heads are embedded in reinforced concrete pile cap. 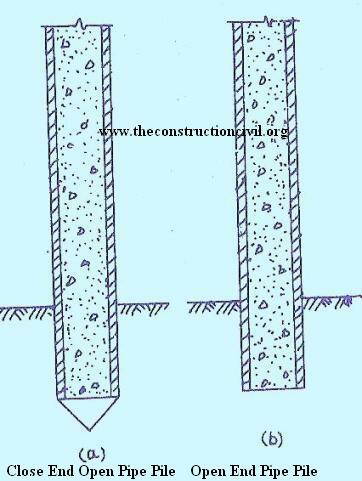 H-piles are commonly used in the construction of bulkheads, trestles, retaining walls, bridges and cofferdams. Seamless or welded steel pipes are often driven to function as end bearing or friction piles. The pipe piles may be driven either open ended or close ended. When the driving end of the pipe is left open, (without any driving point) it is called open end pile. Open ended piles are usually driven to penetrate rock or hard pan. As the open ended piles are sunk in the ground, the soil inside the pipe is cleaned out by means of compressed air, water jet etc simultaneously. When the pipes have been driven to the required depth, they are cleaned from inside and filled with concrete. 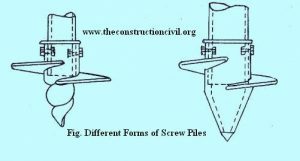 In case of closed end piles, the driving end of each pipe is closed by welding a conical steel or cast iron shoe to the pipe end. In this case also, after driving, the hollow space inside the pipe is normally, filled with concrete. The diameter of the pipes used for piling varies from 25 cm to 120 cm and their shell thickness varies from 8 mm to 12 mm The use of this type of pile for depths of 30 in or more is quite common. A screw pile consists of a cast iron or steel shaft of external diameter normally varying from 15 to 30 cm and terminating into a helix or screw base. The pile shaft maybe hollow or solid. 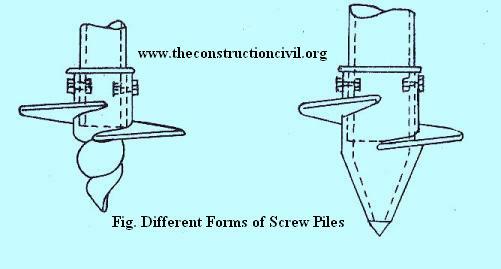 The diameter of the screw at its base varies from 45 cm to 150 cm. The pile is sunk by screwing the pile down inside the ground by use of an electric motor. Screw piles function most efficiently in soft clay or loose sand. In such a ground it is easy to install the piles and also the large bearing area provided by the screws makes the best use of the low bearing capacity of the soil. 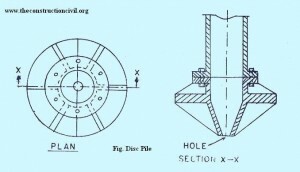 Similar to a screw pile, a disc pile consists of hollow metallic pipe attached with a cast iron disc to its foot so as to enlarge the bearing area of the pile. There is a hole at the bottom of the pile to permit the water jet pipe to pass through during the sinking of the pile by jetting. 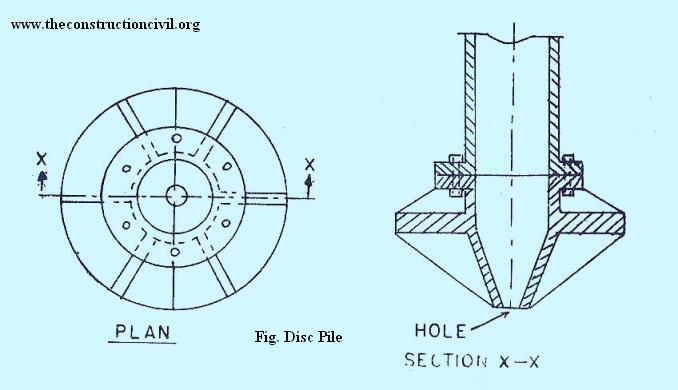 Disc pile can he used only in sandy or soft soils which may permit sinking of the pile by water jets. Disc piles are used mostly in marine installations, where the total penetration of the pile in the ground is required to be large.